How to create models in XSI and other 3D applications and make them work in Battlefront 1 & 2. 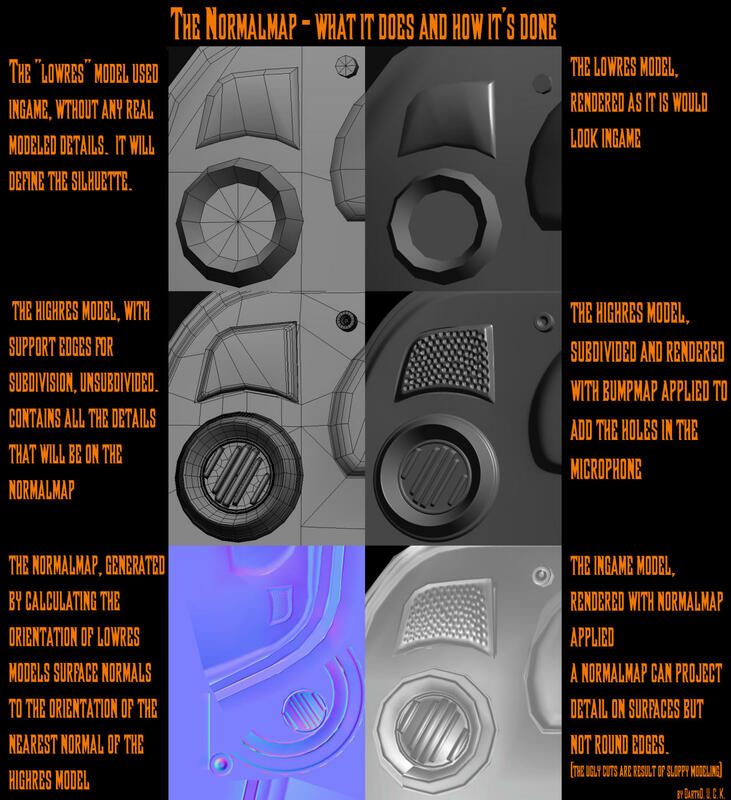 Post models, tips for application usage and share anything XSI, 3DMax, SketchUp, etc. While there are finally quite some modders who make custom models for Battlefront, thanks to RepSharpshooter's meshtool, most do not go the extra steps that can make a good model look even better and a great model look awesome ingame because they do not know about them. After being asked by some people about some things for some time now I decided to start a thread that explains the most important things that can be done with the Pandemic tool or hex editing or in XSI which will make your models look more polished. Realize the full potential of your models now!!! I'll update this thread within the coming days or weeks, so check back. 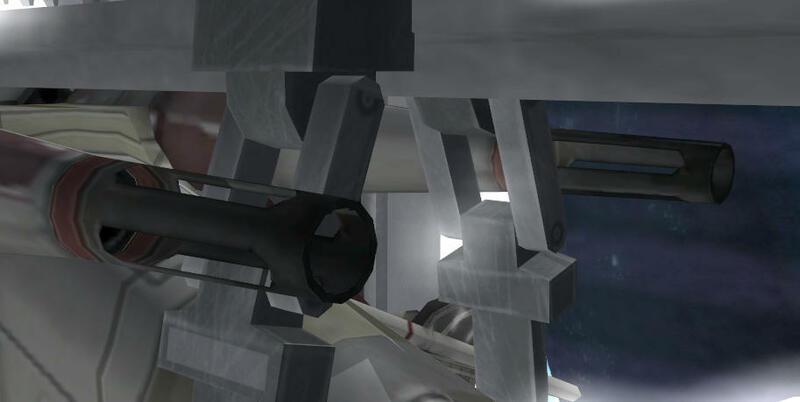 A low resolution model is what Battlefront displays when you see an object from a distance. If the object has no lowres model, it will become invisible. Thus you should create lowrez models for your objects especially if they are used on large maps and/or maps with many objects at once on the screen. Hence its name, the lowres model is supposed to have less polygons than the normal model. Therefore you should create a copy of the normal model and reduce its polygons. You must not use the "Polygon Reduction" tool for this, it doesnt work on game models because it doesn't know which edge is important and which is not, it will just evenly remove them. Deleting unneeded edges will take some time but it is worth it, especially because you can use the lowres model also as base for the shadowvolume and collision. The shape, you see lowres models only from far away so you will not be able to see any details and if some surfaces are round. The UV, every UV has cuts somewhere, make sure not to delete the edges where the uv pieces are split. Thats basically what you need to pay attention to, all edges that dont contribute to the shape or the UV should be deleted. There is no hard number for the polycount of the lowres model, depending on the shapes complexity and details on the normal model it could have from one to three quarters less polygons. All you have to do is name the lowrezmodel "whatever_lowrez", if it has multiple parts, you don't need to number them, the "_lowrez" extension is enough. Units are a special case, they use a seperate msh for the lowres model and have to be enveloped to the lowres skeleton. You can find one converted by AceMastermind in Andes XSIZETools or download it from here. This lowres model is too detailed for normal usage, but here its needed because models switch to lowres even when the camera is really close. anyway, this is also a very good example on how very little effect rounding edges have ingame. In Battlefront all objects receive shadows but they don't cast shadows by default. in order to make an object cast a shadow you have to include a shadowvolume in the msh. There is also a msh.option line "highresshadow" that makes btatlefront use the normal model as shadowvolume, but because shadows eat a large amount of performance in Battlefront you should only use it on very primitive models. The shadowvolume should be created just like the lowres model or be based on it. A shadowvolume is even less detailed than a lowres model because it doesn't need support edges for the UV and the shape can be more rough because it is ony projected on the ground which distorts it and the player pays less attention to it than something in front of him. To make Battlefront use a model as shadowvolume, name it "sv_whatever". if you have multiple shadowvolumes, just give them all the "sv_" prefix. that may not work all the time, if it doesn't then merge the parts together. 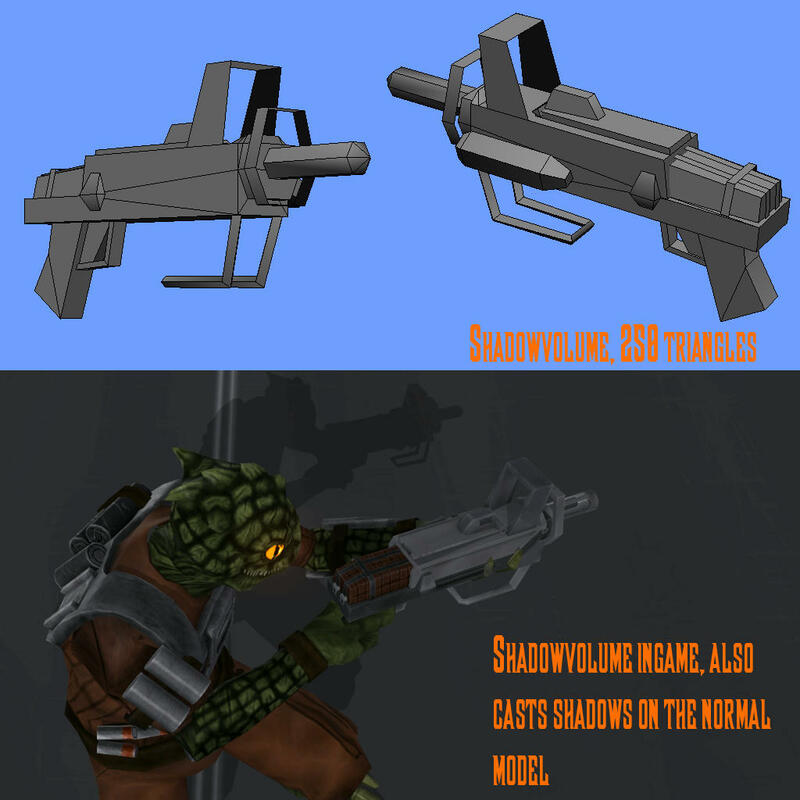 As you can see the shadowvolume also casts a shadow on the normal model, you can see the notches shadow on the gunbody. A specular map allows to have dynamic specular highlights on the model where it is hit by light. The highlights are generated depending on the orientation of the object to the camera and the light source. The specular map itself is a greyscale texture that contains information about how bright the surface gets when it is hit by light. The brighter the specular map is, the brighter the surface will get ingame. You can have no specular map at all, then the model will have bright round specular spots and look like plastic. You can have a specular map with solid colors so that you differ the specular intensity of the different materials on a texture. You can also have a detailed specular map which contains as much details as the diffuse texture. You can have scratches that become brighter than the surrounding surface or dirt that does not react to light all that much. You can create a specular map from the diffuse texture. 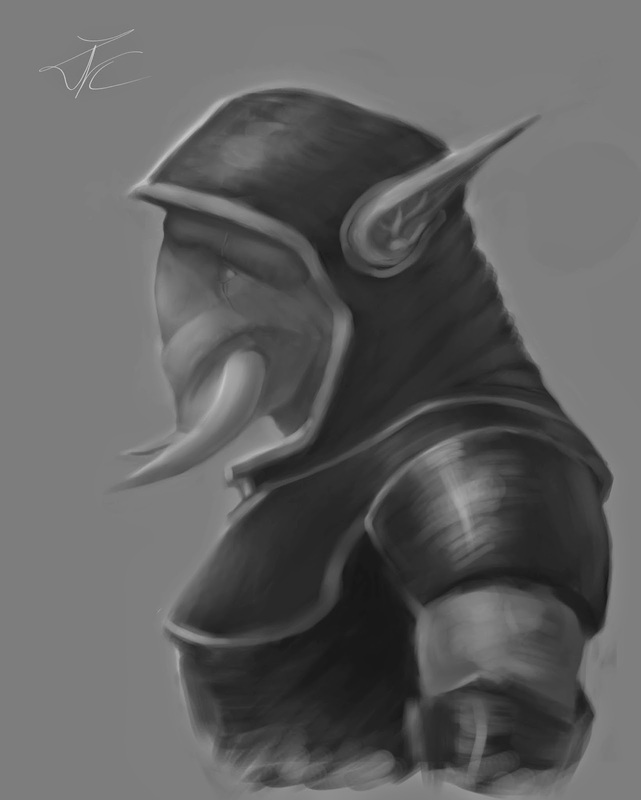 Make it a greyscale image and increase the overall contrast through "values" or "curves" in e.g. gimp. Ideally the diffuse texture should not contain any specular at all because it is added by the specular map dynamically. Therefore, if you create a new diffuse texture, don't include much specular highlights e.g. bright streaks on cylinders. You can set the specular color and decay(size of the spots) in the object's material and it will be carried over to the game. To specular map a surface, apply the rendertype "4", you dont have to set any values or additional textures. The specular map must be stored in the difuse texture's alpha channel. You do that by adding a mask to the diffuse texture and then copy the specular map in the mask. You need to have your lighting at least set on medium to see the specular ingame. In order to make the specular map show up, your map requires a directional light that has "Cast Specular" enabled. 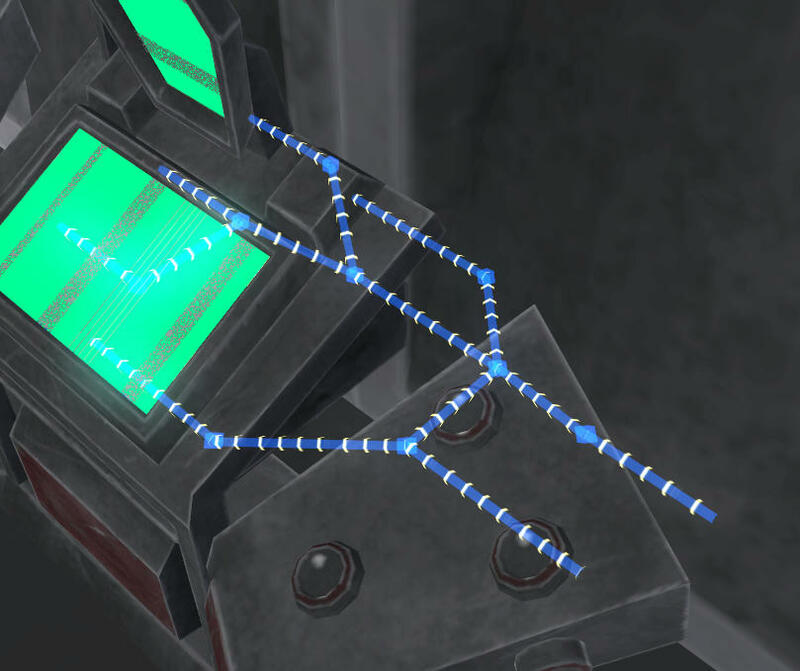 A bump map allows to fake plastic detail on a surface. It is a greyscale image that contains a heigth value for each pixel, if its brighter than the surrounding pixels, its moved "up" and if its darker its moved "down". Ingame the shadows on the surface are created dynamically depending on the object's orientation to the light. Bump maps work especially well on rough surfaces like rock or can make panels or bricks look plastic. Because their effect ingame doesn't change depending on the camera orientation, they arent really noticeable on smaller objects unless they are moving and/or have specular/gloss applied. The first downside of bump maps is that the height information is only created by comparing directly neighbouring pixels. That means you can't fake round or sloped details with gradients! Due to this its also not really possible to have various heights, for example you wont see a height difference ingame between two moved up panels that have a different brightness on the bump map. The second downside is that the effect gets weaker the sharper the angle is from which you look at the surface, and it only really looks plastic if you are nearly looking straight at it. You cannot, never ever create a bump map just from the greyscale of the diffuse texture! Please dont use Pandemics bump maps as reference for that. They did totally weird work, especially on the weapon bump maps. Anyway, its best to start with a solid grey texture "888888" so that you can move things up as well as down. Now look at the diffuse texture to see which surfaces should be moved up, color them brighter/white. All surfaces/grooves that should be moved down need to be colored darker/black. After you are done with these details you can add some "low frequency" detail like scratches or damage or structures on rocks etc. You can make these by using the greyscaled diffuse texture but remember that the result of that will always be totally incorrect(that doesn't mean it will look too bad ingame) because the diffuse texture already contains shading most of the time. If you have a small groove/ridge on the diffuse texture it often has a bright edge on one side and a dark edge on the other. If this is used for the bump map it will result in a groove one one edge and a ridge on the other edge rather than a groove/ridge in the middle. If you create a new diffuse texture, dont include shading for the details e.g. bright edges on the borders of ridges because they will be added dynamically ingame. To bump map surface, apply the rendertype "27", and enter the name of the bump map in the "texture1" slot. and after that list the names of the textures that should be bump mapped, separated with a space. This is useful if you quickly want to bump map something, but be careful if you have any flag (rendertype/transparency) applied to a texture listed than either the bump map or the flag wont work and there may be lighting issues ingame. The first parameters makes Battlefront convert the bump map to something usable as height map and the second specifies that the bump info is in the texture's rgb-channels. 6.0 is about the default value. You need to have your lighting setting on high to see the bump map. In order to make the bump map show up, your map requires a directional light, I suppose. A normal map is basically a better bump map. While a bump map only has one channel (pixel height), the normal map has 3: red (x-vector), blue (z-vector) and green (y-vector) and therefore contains much more information about the surface. It takes much more time to make than a bump map though because you cant just paint on the details, you have to bake them from a model that really has them modeled in. A normal map is usually created with a 3d application, you need the model that is going to be in the game and contains all the basic shape and the silhouette and a high resolution model that has all the details modeled in you want to have in the normal map. The highres model can either be created by a sculpting application like Sculptris or ZBrush or modeled with subdivision/hard surface modeling. After you have finished the high resolution model you can apply a bump map if you want to have scratches or really small details or structures in the bump map. To normal map a surface, apply the rendertype "27". In the "Texture 1" slot insert the name of your normal map with .tga extenstion. This is actually not necessary for it to work, it results in some kind of compression of the texture which is probably better for performance. You need to have your lighting setting on high to see the normal map. In order to make the normal map show up, your map requires a directional light. Remember, however that Battlefront's lighting system is a little old so the normal maps ingame will not be as clear and strong as in XSI. The specular map needs to be put in the bump map's alpha channel. To do this, open the bump map in your favourite image editing application, apply a mask to the bump map and copy the specular map in the mask. To normal/bump and specularmap a surface, apply the rendertype "28". In the "texture 1" slot insert the name of the bump/normal map with .tga extension. If you have your lighting setting on medium this flag will be interpreted as specular map flag. This means that you also have to put the specular map in the diffuse texture's alpha channel if you dont want people who play on lower settings to see your model looking all plasticy. An environment map allows the model to reflect the environment dynamically, depending on the orientation of the model and camera. envmaps look especially cool on round surfaces. If you have no environment map, then the model will reflect the real environment. 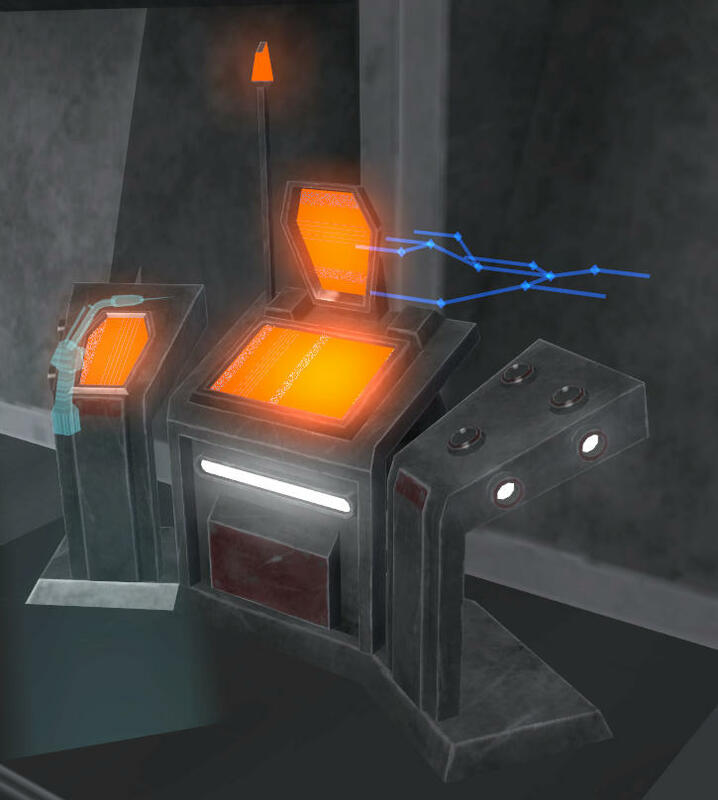 If you have an environment map (cubemap), then battlefront will generate a textured cube from it, that surrounds the model and will project the cube's texture onto it. The cube map is basically an unfolded cube and each side represents one side of the "room" in which the object is located. The alpha channel of the environment map determines its opacity. Make sure that sides aren't switched, its supposed to reflect whats behind you when you look at it. To environment map a surface, apply the rendertype "6". In the "texture 3" slot insert the name of the environment map with .tga extension. You need to have your lighting setting at least on medium to see the environment map ingame. If you take a look at the examples ingame, you will see that the environment maps have a different effect. This is the result of different specular decay. If you dont modify the specular decay in XSI the object will be very bright and glowy and you will hardly recognize the environment map. 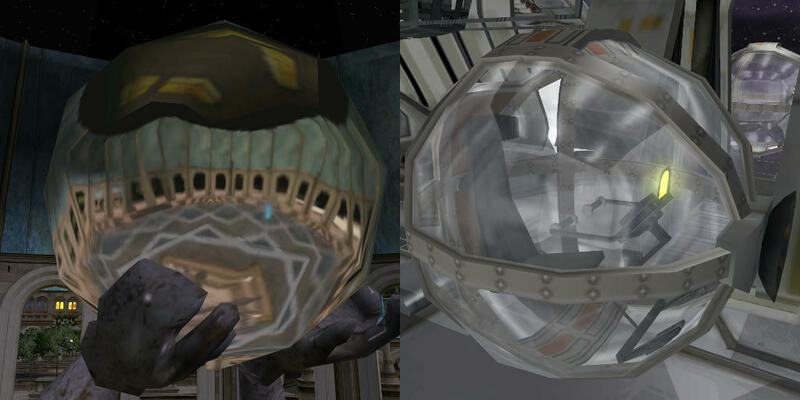 The fountain ball on Naboo has no glow at all. These are the two extremes. The LAAT balls have a specular decay inbetween those two, to be exact they use the tantive4trooper's inserted through hexediting. AceMastermind made a list of the hex values for every rendertype in this topic, if you scroll down, you can also see a list of all hex values for the 5th place flags. In order to create the flags that need an input for texture1, apply a bump map with the meshtool. Then open the msh with a hex editor like HxD. Search for "ATRB", this marks the beginning of the section that contains the flags of a material. After this you will see "TX0D" and a texture name, this is the diffuse texture. Your msh will most likely have several materials so make sure to select the one with the right texture. After the diffuse texture name this material should also have "TX1D" and the name of another texture (with "_bump" at the end), this is the "texture1" slot from the Pandemic tool. You can name the texture however you want, just make sure that you dont overwrite any data if you increase the length. Now set your cursor behind the "B" of "ATRB", the value "04" right after "42" should be selected in the hex values. This is the first place after ATRB. Your material should have "80" in the fifth place which results in gloss, put in "00" if you dont need it or some other value. Your material should have "1b" in the sixth place, which is rendertype 27 (bump map), now replace this value with the hex value of the rendertype you want to apply. Save the file and you are done! If you want to apply an environment map, just use the Meshtool. You can modify the name of the environment map texture, it can be found after "TX3D" (texture 3 slot of the Pandemic tool) in the material. Glow allows you to have lightbloom on surfaces, it will also make them brighter. The color of the diffuse texture determines the glow color and the alpha channel determines the glow strength. 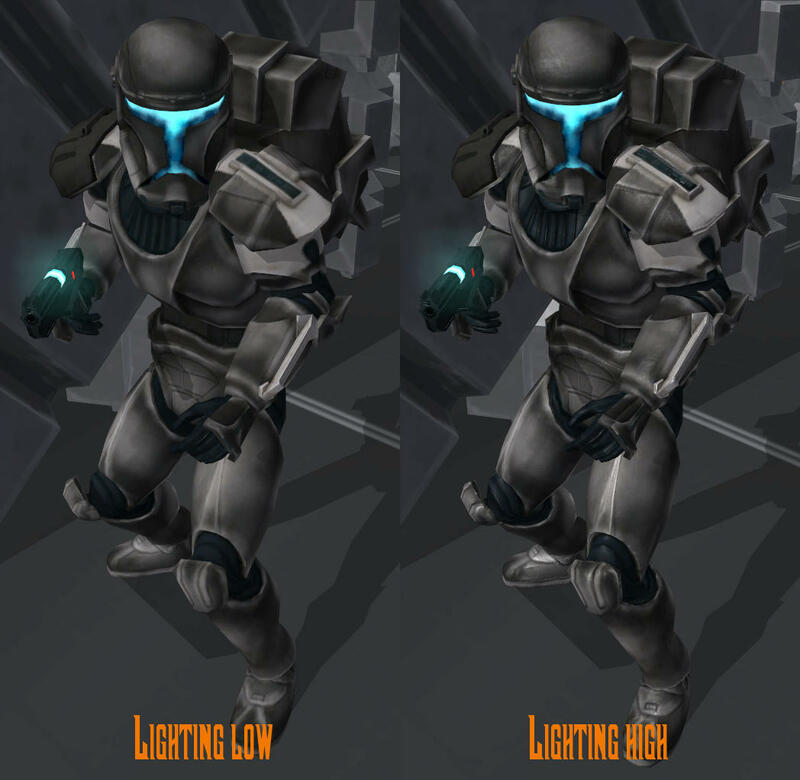 The strength of the glow depends on the size of the glowing surfaces ingame. Really small surfaces will hardly have lightbloom but this glow gives already much better results than the glow through rendertype. White is extreme glow and black is no glow. If you still want to be able to see the surfaces color ingame, something like white with atleast 60% black is a good place to start with. You might have to adjust the strength several times though. When you are done with the glow map, add a mask to the diffuse texture and copy the glow map into it. In order to apply glow to a surface you have to hex edit the 5th place flag of the material to either "02" - glow or "03" - increased glow (glow and emissive colors to be exact). When you make the model, surround the parts that will glow with edges to separate it from the rest of the surface and give the glowing polygons a separate material so that you can enable glow only on these. You have to do this because a polygon with glow applied, even if the glow map is black, will be brighter than other polygons and not receive any lighting. You need to have lightbloom enabled to see the glow ingame (suprise, suprise! ), with it disabled the glowing polygons will still be brighter than usual though. Gloss is pretty similar to specular. Its also calculated depending on the surfaces orientation to the light source and camera. The difference is that while specular generates white spots, gloss makes the model really glow when it is directly hit by light. Therefore it should be only used on small models because you will get huge glowing areas otherwise. The disavantage of gloss is that you cannot edit the intensity. Gloss doesn't care about the texture's alpha channel so nothing to do there. In order to apply gloss to a surface you have to hex edit the 5th place flag of the material to either "80 or "A0", I dont know if there is any difference between these two. You need to have your lighting setting at least on medium to see the gloss ingame. 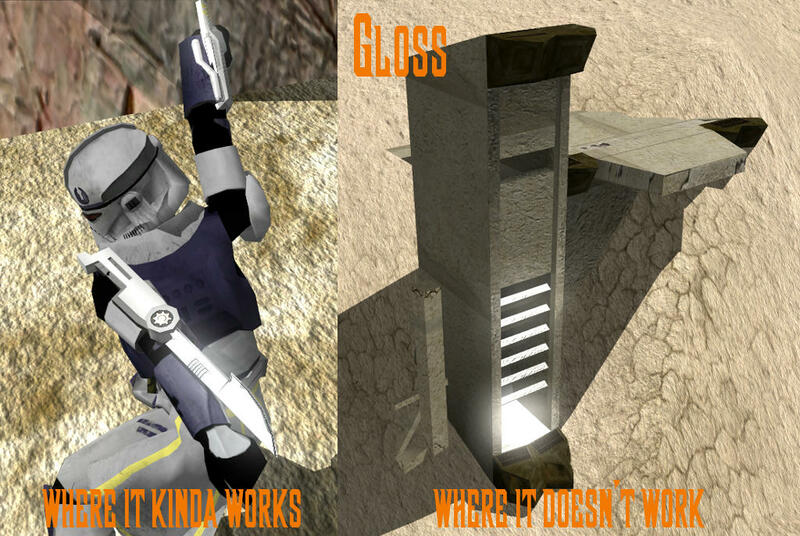 Here are two examples of gloss. It looks pretty good on the blade in this moment but if it has a certain orientation the whole surface glows and you will hardly see the texture. On surfaces as big as on the wall it just doesnt look right. The special feature of hardedged transparency is that it outputs only two transparency values ingame. Either a pixel is visible or invisible. This is especially useful for objects like fences or railings or a thin surface with holes. The advantage of hardedged transparency is that you dont get the usual display "bug" when you see multiple transparent surfaces behind each other which displays the rear surface as if its in front of the other surface. No extra work on the texture needed, its handy to have the alpha channel with strong values though. That prevents you from being surprised when pixels show up ingame that are not supposed to be displayed or vice versa and thus having to edit the alpha channel again. To add hardedged transparency, you have to add "1" to the first number of the fifth place. Since you will most likely have transparency enabled the fifth place will be "14" or "18", the second number (4) being single sided or "8" being doublesided transparency. The special feature of additive transparency is that it has a soft glow that increases when you see multiple polygons behind each other. The glow also gets more intensive the more opaque the texture is. Additive transparency can be used really well for holograms of (force) ghosts. No extra work on the texture needed, you could modify the brightness though if the glow is too strong or weak. To add additive transparency, you have to add "4" or "6"(with emissive colors) to the first number of the fifth place. Since you will most likely have transparency enabled the fifth place will be "44", "48" or "64", "68", "4" in the second number being single sided and "8" being double sided transparency. More updates are coming soon! Last edited by DarthD.U.C.K. on Mon Nov 21, 2011 9:47 am, edited 24 times in total. Bravo! Good on you for making this topic, D.D! Hopefully we'll all start using maps a bit more. I've been using normal maps occasionally, but never tried a specular.....Are they useful in any model, or are they mainly used for units/weapons/vehicles? What i mean is, would you apply this to a brick/stone wall? I had another question. Does bf2 support height maps? Or are they just a more basic form of normal/bump maps? EDIT: Are these maps a lot more resource-intensive then only applying stock textures? first: specularmaps look good on pretty much anything (except on materials with very weak specular), especially in things that move (e.g.units!). depending on the lightorientation its not always visisible on smaller things like weapons. on "rough" surfaces like rocks or a brickwall with a lot of possible additional heightinformation going one a bumpmap is going to have a better effect, if you have to choose. but you dont have to, you can have both specular- and bumpmap (its rendertype 28 and the specularmap is in the bumpmaps alphachannel) but im going to write that in detail tomorow or so. heighthmaps(in the currect- previsouly next-gen games) are used additionally to normalmaps to add details to the silhuette which normalmaps cant do. they look just like ordinary bumpmaps. battlefront doesnt support them. in older games "heighthmap" can refer to bump- and normalmaps as far as i know. Projects :: WIP. I will reveal what it is later on.. This is great, thanks D.U.C.K. I can't wait for more updates. lucasfart wrote: What i mean is, would you apply this to a brick/stone wall? It looks best on units, vehicles, and weapons. I find it looks poorly on building models, specifically stone or wood textures. Specular looks best on metal and plastic textures. lucasfart wrote: Are these maps a lot more resource-intensive then only applying stock textures? Well that depends on your certain point of view. In order to see bump or normal maps, you have to use High light settings, which are more resource intensive. If youre using the Pandemic Exporter you can change your materials specular color(definitely works with straight specular, dunno about spec-maps). Depending on the material of your model this can make it look even better. i wrote some more.... and thanks for the info ande! i added it now. lucasfart wrote: EDIT: Are these maps a lot more resource-intensive then only applying stock textures? not really, they mostly cost memory (both in the mapsize and ram) because they have to be loaded additionally to the normal textures. specmaps dont need a seperate texture so they dont take up much space and have great effect in relation to their "size". most people have a pretty good internet though and dont care about a few mb more, especially if it adds to the visuals of the map. i wouldnt refrain from adding more flags or shadows for that matter because everybody cna just turn the settings down if its to much for his computer. Really nice explanations. I am really interested with maps these days (looked lot of topics on Polycount ). Thanks. THEWULFMAN wrote: I find it looks poorly on building models, specifically stone or wood textures. It is your opininon, but normal maps are really usefull for baking details on the lowrez mesh from a sculpted/high poly mesh, especially on stone and wood. I was talking about Specular, not Normal maps. Ah ok, it is alright then . i added an explanation for bumpmaps and hexediting rendertypes now. Thanks a lot for doing this Darth. It's really helpful to me, and i'm sure a lot of others too. I was wondering about your hex-editing section - is their any benefits to hex-editing instead of using the meshtool? They both achieve the same thing don't they?? You can do more stuff with hexediting, but you have to do it manually. And dont ever edit the first 4 places after ATRB(or any chunk)unless you know what youre doing, this could break the whole msh file. lucasfart wrote: Thanks a lot for doing this Darth. It's really helpful to me, and i'm sure a lot of others too. I was wondering about your hex-editing section - is their any benefits to hex-editing instead of using the meshtool? They both achieve the same thing don't they?? like andeweget said, you can only do three things with the meshtool (glow, bumpmap, envmap). the glow can be done better by hexediting (meshtool uses the rendertype glow which requires and extra texture and isn't that strong) and the 5th place flags like the different transparencies can't be done with either meshtool or pandemic tool. Gonna have to read through this carefully since I wanna do a v2 of the N-1 but have the chrome parts actually look chrome if possible. minilogoguy18 wrote: Gonna have to read through this carefully since I wanna do a v2 of the N-1 but have the chrome parts actually look chrome if possible. Maybe an environment map ? DarthD.U.C.K. wrote: ...laatballs have a speculardecay inbetween those two, to be exact they use the darktroopers inserted through hexediting. I just noticed this. I actually used the values from from the HK-49 model, but the values from the Tantive 4 Trooper would also work. ive added lowres and shadowvolume to the xsi section now. ill probably also add hard edges and vertex colors later. 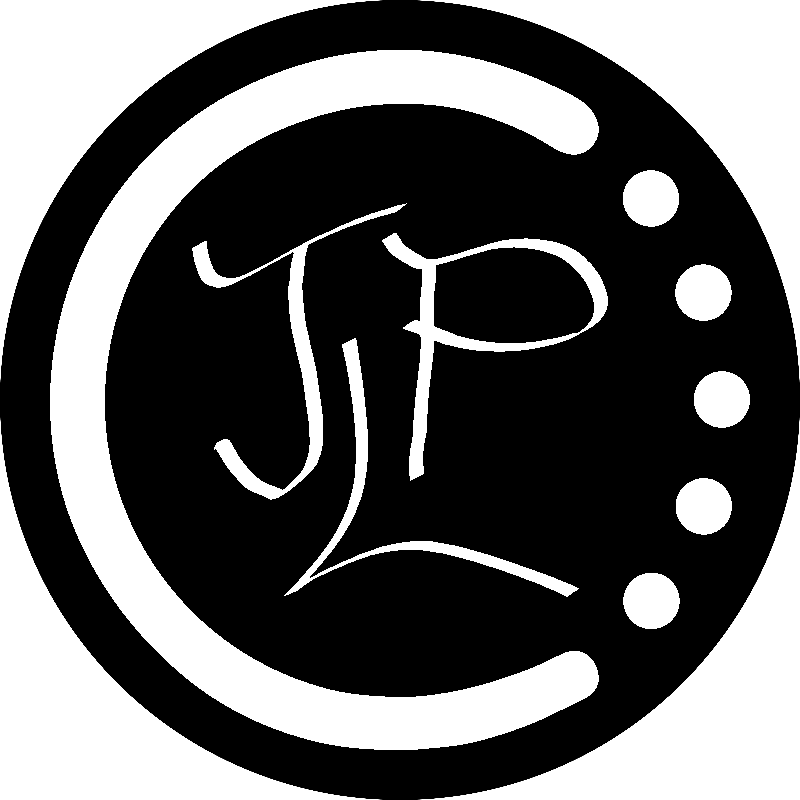 Projects :: Not sure keep changing my mind. Additional info for shadowvolume and lowres. If you have a really big model (such as the Azzameen space sation I am working on), it is good to break the lowres to multiple parts. Having one really big one can cause the model to "flash" in and out of lowres depending upon where you are looking. Also you can use _lowres as the extension works the same as _lowrez. For shadowvolumes, especially on buildings, you may actually have to add extra geometry to block the light coming though some walls. Example if you have a building with a window on one wall and it is suppose to be solid wall opposite if the shadwvolume for the wall isn't solid you will see light from the window on the ground outside the solid wall. Basically all shadowvolume geometry should be solid, no deleted faces.